The “Connect with User’s Identity” is the “PassThrough” authentication mode we had in MOSS 2007 BDC. The other 2 relates to Single Sign On. 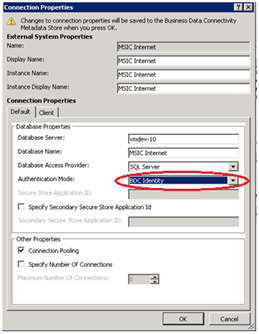 Now that we have Secure Store Service Application, we can use “Connect with Impersonated Windows Identity” OR if we are using claims token we can use “Connect with Impersonated Custom Identity”. All good but what if we want “RevertToSelf” authentication mode? Finally after running the above script we can change the authentication mode to “RevertToSelf” using SharePoint Designer (SPD), select the external content type and click the “Edit Connection Properties” in the ribbon, and in the “Connection Properties” dialog change the “Authentication Mode” to “BDC Identity” as shown below, this will allow the list to automatically connect to the external source for all kind of user. Cool… the next and final step is to set the correct permissions (object permission) on the external content type via SharePoint Central Admin, I will cover this in my next post (Making BCS work for anonymous users – Part 2).. 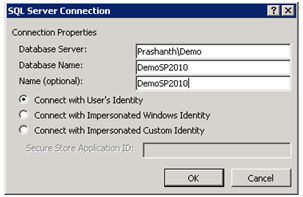 This entry was posted in SharePoint 2010 and tagged BCS, SharePoint 2010.